Congratulations! You're now a member of Club Express and can enjoy all the advantages. *FINAL PRICE EACH WAY (Taxes, surcharges and service fees included). You must first enter the origin. Are you a resident and/or a Large family? 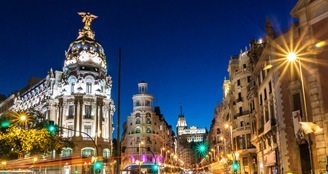 Madrid is a highly attractive capital for tourists. The Plaza de Oriente square, the Royal Palace, the Almudena Cathedral or the Royal Theatre are all must-see places and monuments. Take calle Alcalá from the bottom of the Gran Vía head towards the Puerta del Sol, then on to the Plaza Mayor square. Close by, in the La Latina district, you can find the best tapas bars in the city. No tourist visit is complete without the Prado, Reina Sofía and Thyssen art museums. The Retiro Park, the lungs of the city since it opened to the public in 1868, is the perfect place to take a stroll or get exercise. It is also home to several monuments. In the park centre there is an artificial pond, where you can rent rowboats and paddle around. Located on one of the banks is a monument dedicated to Alfonso XII of Spain. Close by the pond is the Crystal Palace, used for temporary exhibitions and another of the park's main symbols. The Gran Vía is the street that never sleeps in Madrid. To build this street, more than 300 houses were demolished and nearly 50 streets were affected. 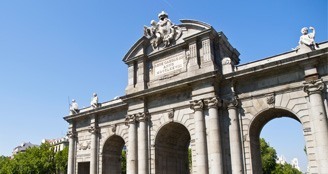 Connecting calle Alcalá to the Plaza de España square, the Gran Vía is now the centre of commercial and leisure activity in Madrid. Its old cinemas and theatres, offering leading productions and musicals daily, make it the Broadway of Madrid. Join our Club in just 5 seconds! Discounts guaranteed on all your bookings. Hold Price for 24 hours. Club Express is a club of users who, as target customers or potential customers with a special loyalty to Iberia Express, are offered the possibility of accessing advantages, special discounts and, in general, preferential treatment. Discounts offered to members of Club Express are applied to the fare (not including taxes). They are accessible through the private area of the Iberia Express website exclusive to Club members, or through the landing pages sent in our members' Newsletter. Discounts are valid for flights operated by Iberia Express. The general conditions, fares and discounts applied may be subject to change. Given that it is a closed club, Iberia Express reserves the right of admission to Club Express. The sending of commercial communications on the products and services of Iberia Express, for the purposes of maintaining members of the Club informed of the advantages and promotions designed exclusively for them. From time to time, these communications may include products and services of Partners of Iberia Express, provided they are related to products and services of Iberia Express (hotels, cars, etc.). Other activities relating to the club's aims, including the analysis and creation of profiles for a better definition of the products and services you may be interested in. All information sent will be issued to the home address, email or mobile phone provided by the user in the membership form. In the event of changing any of the personal data provided, members may change them through the Iberia Express website. All those persons whose personal data have been handled can freely exercise their rights to opposition, access, rectification and cancellation in accordance with Organic Law 15/1999 of 13 December on the Protection of Personal Data. In writing, sending a request with identification enclosed, to the following address: IBERIA EXPRESS, calle Alcañiz, 23. 28042 Madrid, addressed for the Legal Department. 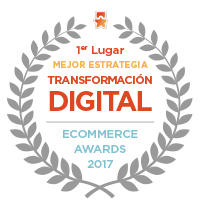 By email to the address lopd@iberiaexpress.com, with the request accompanied by a copy of your corresponding National ID document. For any clarification or doubt relating to Data Protection, you can contacts us at the email address: lopd@iberiaexpress.com. Additionally, at the end of each email issued, a simple option will be provided for members to unsubscribe with immediate effect. Find out more. flecha Created with Sketch.